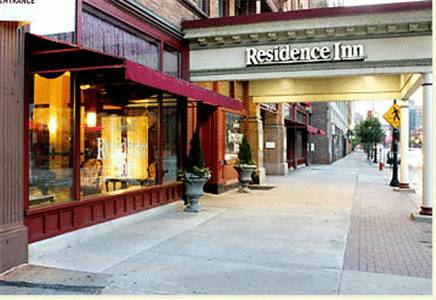 Experience the comforts of home in the Historic Gateway District at the Residence Inn Cleveland Downtown located in the heart of downtown Cleveland surrounded by exclusive dining and shopping. From short weekend getaways to long business trips, our extended stay hotel suites provide a fully equipped kitchen, pullout sofa bed and work area with complimentary high speed internet. Treat clients or your significant other to an exceptional stay and explore nearby attractions, including East 4th Street dining and entertainment, JACK Cleveland Casino, Quicken Loans Arena and Progressive Field. Ideal for executive meetings, our boardroom comfortably accommodates 12 guests, while our largest meeting room provides ideal space to train a group of 50! Stay and discover the perfect balance of home and downtown Cleveland living at the Residence Inn Cleveland Downtown. Cheese has shaped the world, and you can relive the excitement, on a wall, in an Amish town. A town remembers its awful 1876 bridge collapse and train disaster. The town's tourist welcome centre is shaped like a juicy red tomato. Near the Heinz factory, naturally. This "Tomato Capital of Canada" hosts an annual Tomato Festival.